What are the Symptoms of a Bad Control Arm? A “bad control arm” really means there’s a bad ball joint or worn control arm bushings. When these components fail you can experience symptoms ranging from clunking noises to steering wander. This article will highlight the symptoms along with the reasons for control arm failure and what to do about it. Ball joints and bushings on the lower control arm are especially susceptible to wear since, in most suspension setups, the lower arm is actually supporting the weight of the vehicle. Hard driving, offroading, environmental factors, or random damage can compromise these components so recognizing the symptoms early can save you from dealing with a failed part on the side of the road. Specifically coming from the control arm and usually following a bump, braking, or a hard turn. Pulling to the left or right without input from the steering wheel. Wear on the inside or outside edge of the tire or other unusual wear patterns. Excessive vibration felt mostly in the steering wheel as the insecure wheels rapidly wobble. * Other components that can fail and display these symptoms are the wheel bearing, tie rod ends, steering linkage, or rack and pinion bushings. …your first step should be checking the ball joint and bushings. If you are experiencing one or more of these symptoms then your first step should be checking the ball joint and bushings. Again, the components on the lower control arm are usually the culprits since that arm not only has the job of connecting the wheel assembly and frame but also carrying the weight of the vehicle. If dirt or debris make their way into the ball joint when the joint articulates the metal-to-metal (or sometimes metal-to-plastic) surfaces grind against it and wear away, leaving you with a loose ball joint. 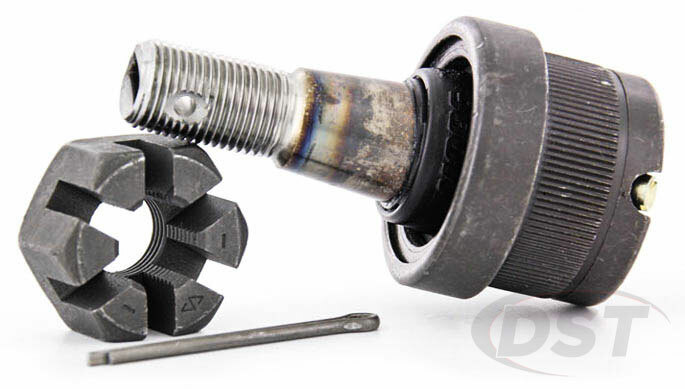 There are several methods for checking ball joints that will alert you to a problem, most of which are just manipulating the ball joint to check for looseness. If there is any vertical play in the ball joint then the ball stud or bearing surface have been worn down. This means you need a replacement since the control arm’s connection to the wheel assembly is loose and will allow your alignment to fluctuate. Rough terrain, driving that taxes the suspension, and environmental factors will accelerate the wear of the control arm bushings until you notice the symptoms and they require replacement. The original bushings installed in OE (Original Equipment) control arms are made of rubber and keep the arm aligned while also absorbing vibration from the road making your ride more comfortable but they are rubber and will wear down. Bushings are fairly easy to inspect visually since failure means the bushing is sagging, hollowed out, or torn. (a) polyurethane boot could increase the lifespan of the ball joint by itself with a very cheap part. These components just don’t last forever. 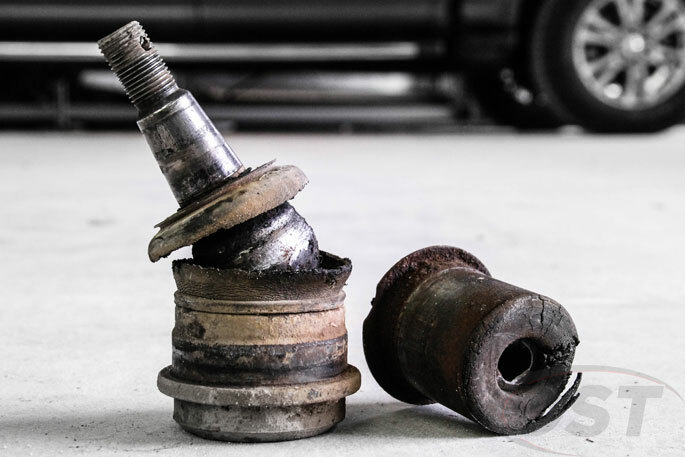 If you own a vehicle long enough you will likely need to replace the lower control arm ball joint and bushings, but you can take steps to lengthen the life of the ball joints. Loose ball joints are generally caused by torn or missing dust boots allowing contaminates inside the joint or inferior materials like a plastic bearing surface being worn down prematurely. If you notice your dust boots are looking a little worse for wear, then replacing them with another rubber boot, or more durable polyurethane boot could increase the lifespan of the ball joint by itself with a very cheap part. If your ball joint has a grease zerk fitting then you can pump new grease into the joint every other oil change as part of your regular maintenance or if you’ve been off-road in mud or water for a long period of time or spend a lot of time driving in icy, salty slush. Rubber bushings will wear out eventually and just need to be looked at from time to time to check for deterioration or gaps. Once you’ve determined that the components on your control arm are worn or damaged the only way to fix the problem is to replace them. The options for replacement can be divided by cost, ease of install, and replacement vs upgrade. can be purchased from the manufacturer or aftermarket suppliers and provide an easy bolt-on solution that will take care of all worn components with one part and installation can be accomplished in most home garages. 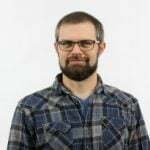 They will likely cost more than buying the components separately but don’t require a press for exchanging the ball joints or bushings so a trip to the shop won’t be necessary. Aftermarket arms will sometimes use better than OE components which will improve handling, wheel alignment stability, and longevity. If you’re restoring a vehicle or just reviving your trusty 200k+ daily driver a control arm assembly is a quick, DIY friendly, complete solution. can vary in cost depending on quality, but they can be affordable as stand-alone replacements. 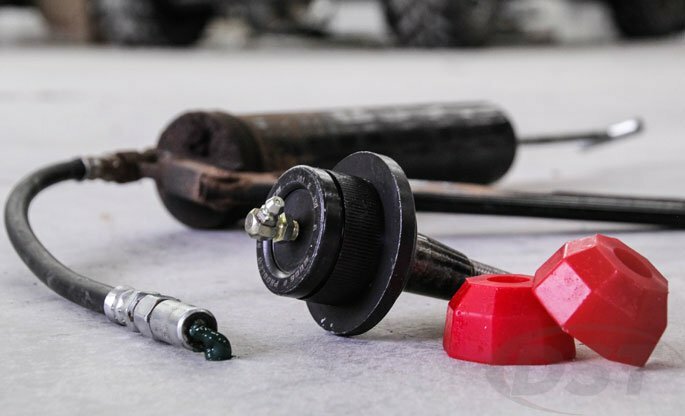 To uninstall and press in a new ball joint you will need special tools that are not found in the common garage making a trip to your local shop or a tool rental necessary. If you’re to the point where you need to replace the ball joint, investing in a more durable aftermarket option made with better quality materials could save you time and money down the road, especially if you drive hard or over rough terrain. are fairly inexpensive but pressing the old ones out can be a tough job. Removing the old bushings can be done DIY and even without a press. Installing an OE style bushing without a press can be tricky, while aftermarket options can be installed in a few minutes. Control arm bushing replacements offer a choice between maximum comfort or enhanced handling performance. Rubber replacements will restore factory ride quality and reduce vibration but provide no improvement over the originals; fine for a commuter. 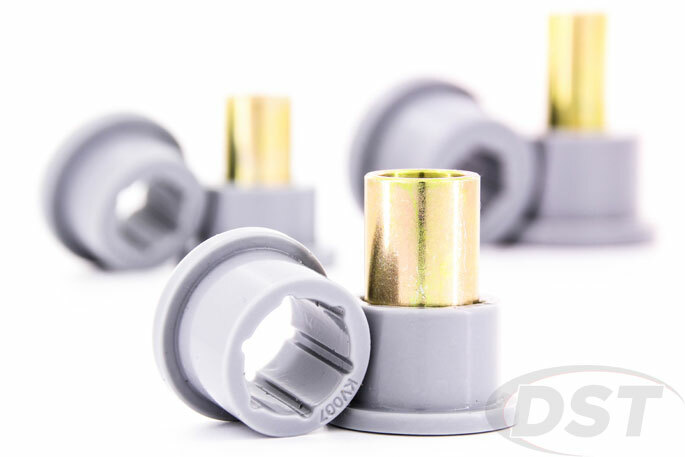 The materials used in aftermarket bushings vary from Delrin to Polyurethane or Heim-style joints to Kevlar infused poly. Compared to rubber they are a harder material which will increase “road feel” or harshness, but they also provide superior handling, improved traction through quick hard turns, and consistent wheel alignment over the life of the vehicle; more geared toward “spirited” driving, off-roading, or weekend track junkies. There are several possible causes for noises, vibration, and steering wander but it’s always a good idea to check the lower control arms since they have a reputation for wearing out. Replacing the arm, or just the worn or damaged ball joint or control arm bushings, can resolve the issues that are causing your symptoms and some aftermarket component options will actually increase handling performance over the originals. 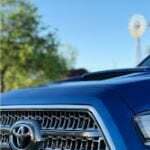 How would we know if your ball joint is supposed to have vertical movement? For that information, you could call the manufacturer or the folks at Moog would probably be able to tell you. So if I have a Moog control arm, can I use the polyurethane control arm bushings or do I have to still use Moog’s rubber ones? If you have a press, or want to try and DIY one, you can put whatever kind of bushings you want into a control arm. There are exceptions of course and you may or may not need to reuse the metal bushing sleeve. Moog’s bushings are going to give you a comfort level and ride similar to the originals, so you may want to consider what balance between comfort and performance you want to achieve before you change out the bushings.